On the west coast we often have the same questions about western redcedar (Thuja plicata). I’m glad to see this. I moved to Seattle this summer and am seeing needles changing color on the western red cedar mentioned by Ryan in the comment above. I’ll probably still ask someone about it, since where they’re changing is an area that was previously ‘buried’ in an English Laurel that I cut back and it’s not happening anywhere else. But it’s interesting to learn that all of them do this. My sister was strongly advised by her last employer never to use Facebook. She needs this information. How can your blogs be emailed? This isn’t a Facebook site. She (or you) can subscribe to it using the “Subscribe” feature in the upper right hand corner of the blog. White Pine is also a brittle wood, and shedding 1/3 or so of its needles decreases surface area..thus it’s able to ‘shed’ snow and not carry as much of a load. It’s one of natures ways of protecting the branches from snapping. Variation in needle turnover in pines is thought to be associated with growth rate and nutrient conservation. i.e., needle turnover is slower for species adapted to nutrient-limited sites and that have relatively slow growth rates. Most conifers, including pines, will not form needles on old wood. Yews are one of the few exceptions to this trend. Interesting info Kevin. Some other pines will re-sprout when young but lose the ability when mature. I rake up all the white pine needles I can on the lawn and re-distribute them under the pines and throughout the shade garden. I think they look beautiful. 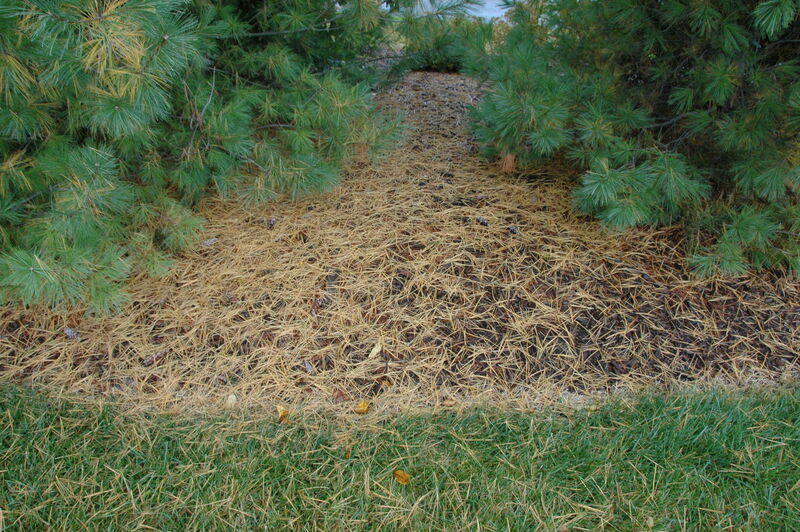 Can someone comment on the pros/cons of using pine needles as mulch? Are they too soil-acidifying for many herbaceous plants over time? It’s hard to argue with free mulch! I used to do the same when I lived in South Carolina and our house was in a development that had a lot of slash pine trees. I agree it makes a nice looking mulch. Pine straw mulch can reduce soil pH, however. In one vegetable (okra) production study, pine straw reduced pH by about 0.5 pH units. Whether this is good or bad depends on what you’re growing and your starting soil pH. I would probably give your bedding plants the final say. Pine straw is a predominant landscape mulch (if not THE predominant landscape mulch in the South) and many plants seem to thrive in it. Okay. This saved me a trip to Extension to look this up. Will share on my local blogs. Every year I try and take photos of fall needle drop so I’ll have them to explain when someone asks about why the needles are yellow in the fall (example: https://www.flickr.com/search/?tags=fallneedledrop&sort=relevance&user_id=38395710%40N07) Is there a Garden Professors Flickr group? 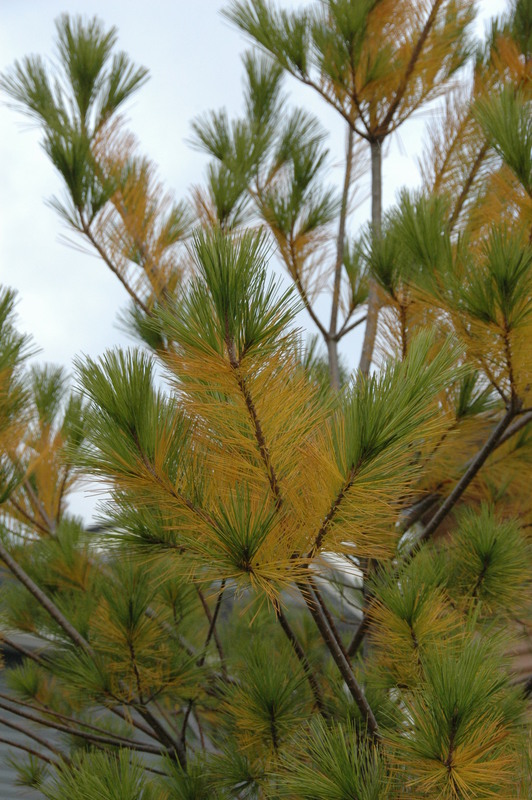 It might be interesting to join and exchange photos of fall needle drop on different pines (among other things). Hi Karen we don’t but it’s an excellent idea! Is the same true for spruce trees? We have Black Hills , and Colorado Spruce. We live in Minnesota.Needl es are browning from the interior. Spruce drop their needles eventually but needles usually persist 5 or 6 years so their normal needle loss is not as dramatic as in white pine. 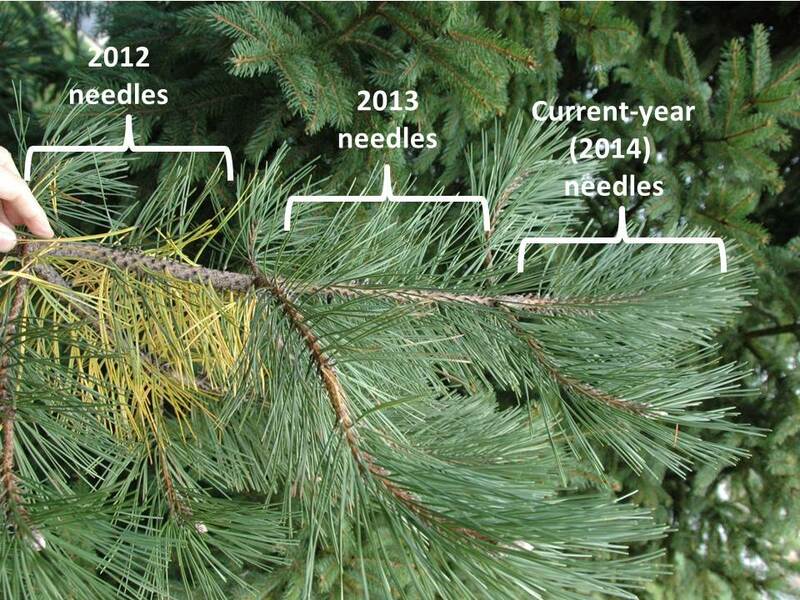 If you are experiencing extensive needle drop on a spruce, it could be a needlecast disease. There are a couple of keys to diagnosing needlecast in spruce. 1) Current-year (outermost) needles are unaffected. 2) Older (interior) needles have black dots that appear under a hand lens (see link below). These dots are actually the fruiting body of the needlecast fungi. Treatment is possible for needlecasts but proper timing is essential and will require professional spray equipment to get good coverage on large trees. It’s been a cold winter. My evergreens are dropping needles/ branches. It looks different than normal needle drop because the needles are green and the branches are about 6+ inches long. Is anyone else experiencing this? Could they have a disease? Will need a little more info to sort out your issue. Do you know what type of evergreen? Pine? Spruce? Something else? Where are the trees? 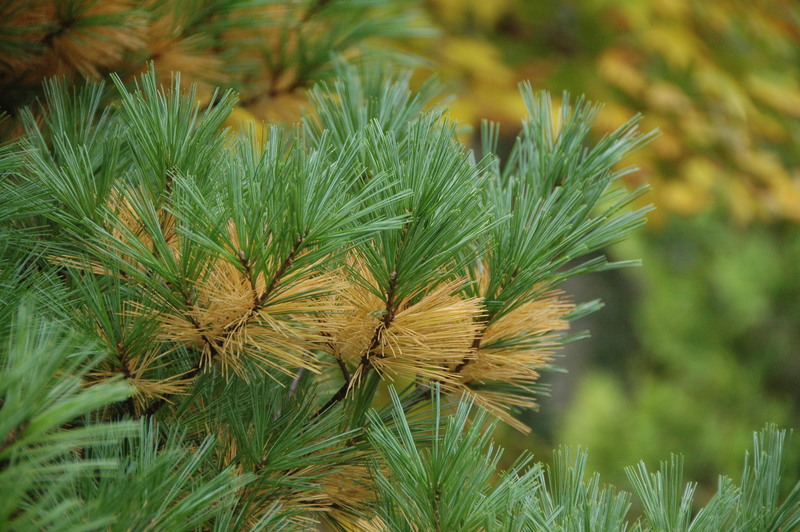 The type of needle-shed described in this article happens to pine in the fall. If you’re seeing needle loss now if could be some type of winter injury. 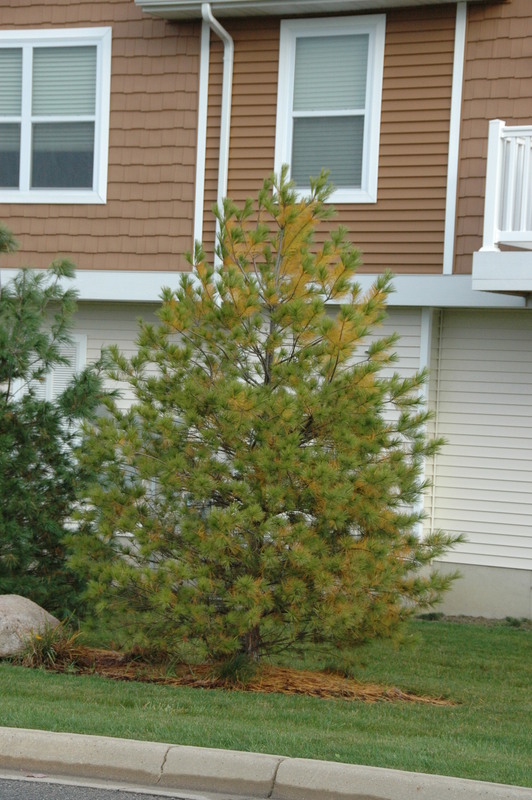 We talked about winter burn on conifers last winter http://blogs.extension.org/gardenprofessors/2014/04/14/feel-the-burn/ If you are east of the Rockies I expect we will see similar damage from this winter’s severe weather as well. If you have access to a digital camera, you are welcome to send photos to my e-mail: cregg@msu.edu. If you send photos try to send a close up of the damage and also a longer shot of the tree(s) and the site.